Getting clicks but no calls? Can’t see your ads anywhere? 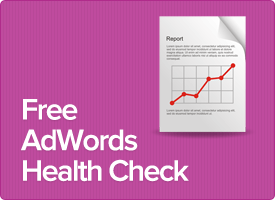 We’re happy to extend our offer for a free Google AdWords Health Check and Report for any business advertising on Google. This will allow you to identify any issues that may be hindering the performance of your AdWords efforts and take steps to improve your campaigns. We offer a comprehensive suite of online marketing services. We are a Google Certified Partner in Australia. Our online advertising initiatives are focused on conversions, not clicks.